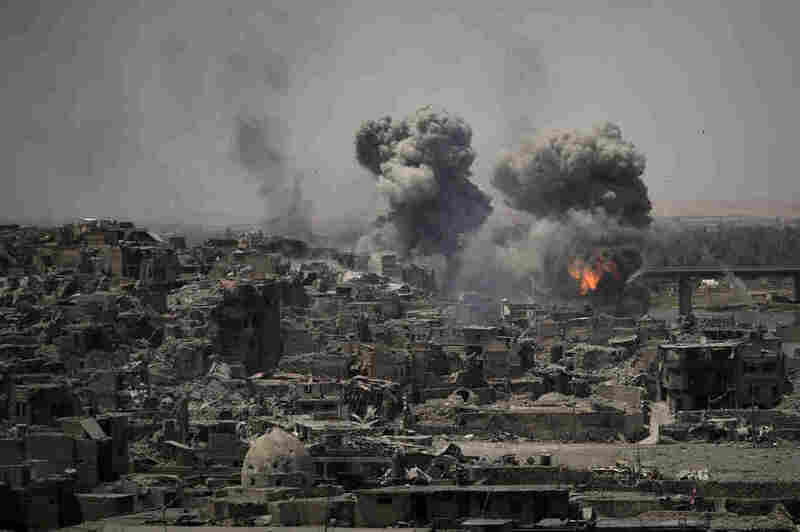 Airstrikes target Islamic State positions on the edge of the Old City on Tuesday, a day after Iraq’s prime minister declared “total victory” in Mosul, Iraq. The forces aligned with Iraq’s government allegedly used crude, imprecise weapons that caused an unnecessary level of civilian casualties, the U.K.-based rights group says. “The scale and gravity of the loss of civilian lives during the military operation to retake Mosul must immediately be publicly acknowledged at the highest levels of government in Iraq and states that are part of the US-led coalition,” Lynn Maalouf, Director of Research for the Middle East at Amnesty International, said in a statement. The report says the number of civilians killed by attacks launched by Iraqi and coalition forces in Mosul from Feb. 19 to June 19 is at least 3,706, citing numbers from the Airwars monitoring group. IS has summarily killed “hundreds, if not thousands” of people trying to flee, Amnesty says. This week, Iraq’s Prime Minister Haidar al-Abadi declared victory in Mosul, which has been under ISIS control since the summer of 2014. The offensive to take back the city began last October, and west Mosul was the last remaining ISIS stronghold there. “Did they [pro-government forces] try to hit IS targets? IS was with you, in your house,” says an outraged west Mosul resident quoted by Amnesty. Retired Air Force Maj. Gen. Charles Dunlap, now a professor at Duke Law School, questions Amnesty’s claim that coalition forces may have committed war crimes. “The law – which even in this context carries, as Amnesty International should know, a presumption of innocence – typically demands evidence of the attacker’s beliefs and intent before ascribing criminal liability. I didn’t see much of that in the report,” he says in an email to The Two-Way. “Amnesty International may think that the pro-government forces did not take all feasible precautions, but they are in no real position to say what was or was not, from the commanders’ perspective, feasible under the complex circumstances of this offensive.